Image: Jessica Spengler/Flickr//Original photo was cropped but not altered for this article. Salad is a healthy mealtime standby for a reason, but these additions make it even tastier and more nutritious. You would think that salad is super healthy no matter how you make it, but that’s not always the case. Creamy dressings, cheese, bacon and fried toppings… These (admittedly yummy) ingredients can cause the fat and calorie content of your salad to skyrocket. In fact, some restaurant salads can have almost a full day’s worth of calories (California Pizza Kitchen’s Moroccan-Spiced Chicken Salad has 1,500 calories and a whopping 99 grams of fat). 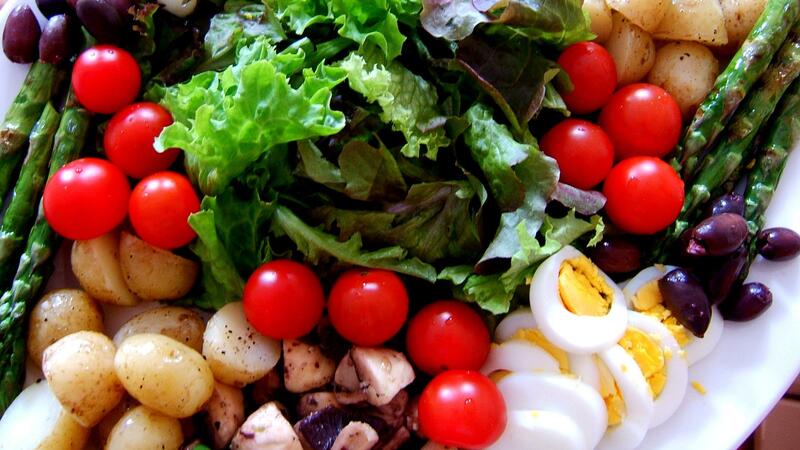 Greatist has a super-helpful infographic featuring some ways you can make a healthier salad. Try using a mix of greens and herbs as the base to liven things up from the get-go. You can add whole grains to your salad for added fiber and texture; lean meats, tofu or beans for extra protein; and, of course, you can pack in as much veggies as you want. You can even add fruits to a lot of salads to jazz ’em up — think pomegranate arils, mango and citrus. A sprinkle of nuts, seeds or something crunchy can make your salad more exciting too. And when it comes to dressing, you’re best off making your own. Check out the full infographic for more ideas on how you can make amazing, healthy salads every day of the week.